New Bedford pet owners often search for alternative treatments to help aging pets deal with chronic illnesses and pain. Arthritis, muscle tension, oncology pain, strains, and sprains are just some of the conditions that can be improved through treatments that are considered by some to be “alternative” to traditional pain management treatments. Animal Therapy Laser and Veterinary Acupuncture are two of the treatments offered at Anchor Animal Hospital in Dartmouth, Massachusetts. Vet care for cats and dogs can include a wide range of treatment options including dietary changes and pet massage treatments. When your pet is in pain or if traditional treatments aren’t working, it’s time to consider something new. Residents of Southeastern Massachusetts can bring their pets to Anchor Animal Hospital in Dartmouth to receive veterinary acupuncture treatments from Dr. Kate Pietsch and her team. Dr. Pietsch is a certified veterinary acupuncturist who completed her training in 2012 at the Colorado Veterinary Medical Association. The techniques that are used through veterinary acupuncture can treat conditions or symptoms through the insertion of very fine needles into precise points on your pet’s body. Acupuncture stimulates healing in some conditions or can be used to provide effective pain relief without prescription medication in others. Some of the conditions that New Bedford pet owners can receive veterinary acupuncture treatments for include arthritis, muscle tension, chronic back pain, spinal cord injuries, nerve disease, and urinary incontinence. This type of vet care for cats and dogs is especially helpful in senior pets, as well as for pets who have unsuccessfully undergone traditional veterinary treatments for certain conditions and illnesses. Other beneficial effects can be seen for gastrointestinal disorders, oncology pain, and even as a treatment for post-surgical pain and discomfort. 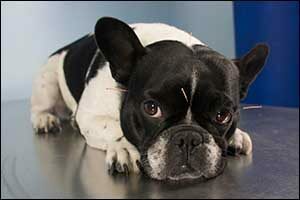 If you are curious about acupuncture for your pet, contact our team and schedule a consultation with Dr. Kate Pietsch. Another type of veterinary treatment that is growing in popularity is laser therapy. While considered by some to be alternative, many hospitals and clinics for both pets and people are beginning to appreciate the benefits of this pain-free treatment option. Anchor Animal Hospital in Dartmouth uses state-of-the-art technology Class IV lasers to provide your pet with much-needed relief from pain and expedited healing. Laser therapy uses specific light waves to penetrate deep into the tissues and stimulate cells. This reduces inflammation and pain while boosting blood flow to the area to stimulate the natural cell growth and healing process. This treatment may sound too-good-to-be-true, but it has been scientifically proven to aid in the treatment of many conditions and disorders. Some of the conditions that can benefit from laser therapy vet care for cats and dogs include arthritis, bone fractures, sprains and strains, lick granulomas, and inflammation due to injury or disease. Laser therapy is often used after surgeries, to help heal bite-wound abscesses, and after tooth extraction to prevent pain and aid in healing. New Bedford pet owners can also bring their family pets in for laser therapy treatments that can benefit dermatitis, abdominal disorders, hip dysplasia, degenerative joint disease, otitis, and many other related conditions. To find out if your pet is a candidate for laser therapy treatments or if they can be applied in conjunction with veterinary acupuncture treatments, contact our team and schedule a consultation with our veterinary staff. We offer many different types of treatments to help New Bedford pet owners take care of their cats and dogs at Anchor Animal Hospital. From nutrition and diet to parasite prevention and control, small animal care, surgery, and emergency veterinary services, you can count on our team of knowledgeable and experienced veterinarians to effectively treat and care for your beloved pet. We have an on-site laboratory and can offer solutions for pain management, advanced veterinary dentistry, and a final act of caring. Call today at 508-996-3731 and schedule an appointment for a veterinary check-up or consultation for vet care for cats and dogs. We also care for a wide range of small animals, including “pocket pets” and rodents. Speak with one of our team members to find out if we offer services at our facility for your pet.